Let me start by saying...Fly, Eagles, Fly! I'll admit, I've never been a huge football fan...but this year has been SO fun to follow along as the Eagles made it to the Superbowl! This was a HUGE win and I'm so happy for our city and proud to be a Philadelphian. 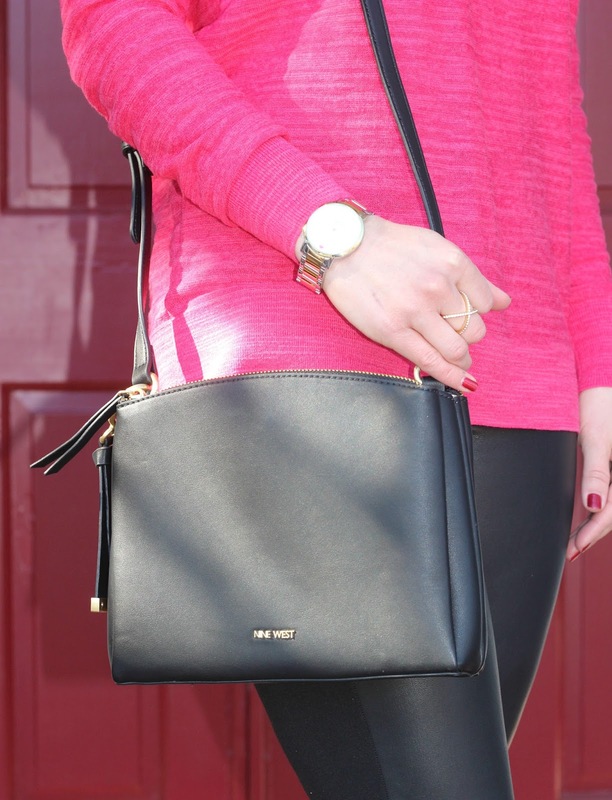 Today I'm styling the prettiest pink cold shoulder sweater with black and gold accessories. This is the perfect date night look for Valentine's Day and would also be cute for dinner + drinks out with the girls! 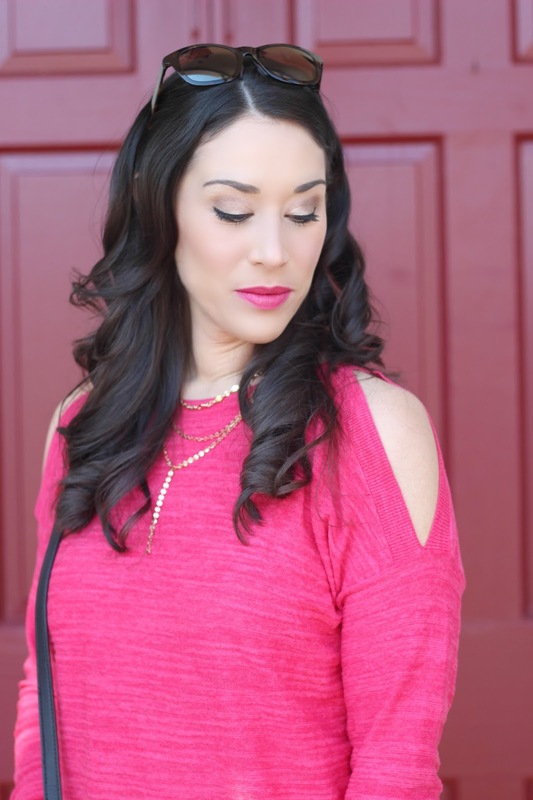 This sweater is SO comfy and the cold shoulder style makes it modern and flirty. It's available in ALL sizes (regular and petite). I also really like that it's just long enough to wear with ponte leggings like the faux leather pair I'm wearing here. My leggings are also from LOFT and are old, so I linked similar options above and in the widget below. I absolutely love hot pink and black together! Now, let's talk shoes. These Franco Sarto pumps (also here) are my new favorites! I bought them to wear at my cousin's wedding next weekend. They are a suede/leather mix and the heel is a totally manageable height. I love high heels as much as the next girl, but when you're a mom and have a baby to carry around, you have to factor in comfort! How chic are these pumps with leather leggings, too!? There are so many outfit variations you can style these pumps with. For accessories, I carried this classy Nine West crossbody bag (comes in 6 colors, BTW!) and wore gold jewelry. This layered Baublebar necklace is such a popular style right now and it seems to go with everything. It's simple but also glamorous at the same time! Okay, I better wrap this up before Logan wakes from his nap.